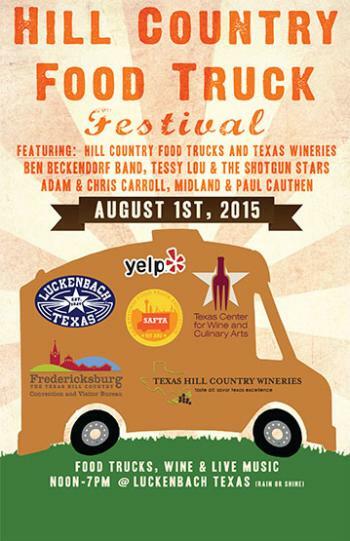 Pack your appetite and head on out to the hills Aug. 1 for the second annual Hill Country Food Truck Festival. As if there weren&apos;t enough reasons to make a road trip to Fredericksburg. Now there&apos;s another mouthwatering excuse to get away. Join us for the second annual Hill Country Food Truck Festival on Saturday, Aug. 1 at the legendary Luckenbach Texas (adjustable belts recommended). Discover tastes to satisfy the most finicky eater, from BBQ to pizza to oh-so-sweet treats. Prepare your taste buds for Slider Provider (Gourmet Sliders), Cheesy Jane&apos;s (Burgers), Wheelie Gourmet (Moroccan), Teka Molina (Mexican), Come and Get It Chuck Wagon (Comfort Food), Stout&apos;s Pizza, Smoke the Truck (Gourmet BBQ), Clear River Pecan Company (ice cream and sweets), Chong&apos;s (Korean), Rickshaw Stop (Pakistani), Oh My Heavenly Eats, Saweet Cupcakes and Kelani Yogurt and more. From noon till 7 p.m., Hill Country food trucks will keep your hunger in check and nine Texas wineries will provide plenty of award-winning pairing options. Purchase by the glass or bottle. Take your pick from Lost Draw Cellars, Becker Vineyards, Kerrville Hills Winery, Singing Waters Vineyards, Texas Hills Vineyard, Fiesta Winery, Hye Meadow Winery, Texas Legato Winery and Solaro Winery. Is a cold brew more your style? No problem, you&apos;re at Luckenbach! Just belly-up to the bar. Of course, nothing goes better with gourmet food-on-wheels than some live Texas music. Kick back to the sounds of the Ben Beckendorf Band, Tessy Lou & the Shotgun Stars, Adam & Chris Carroll, Midland and Paul Cauthen. If it&apos;s raining, throw in your umbrella because this is one shindig Mother Nature will not scare away. Admission to the grounds is just $15 each and kiddos get in free. Proceeds benefit the Texas Center for Wine and Culinary Arts. Make a weekend of it. Come in early on Thursday or Friday and enjoy local shopping, a scenic hike up Enchanted Rock or the annual Grape Stomp at Pedernales Cellars. Browse the art galleries or cycle backcountry roads. Take a step back in time at local museums. There are plenty of activities to help you work up an appetite big enough for the second annual Hill Country Food Truck Festival.